Hello! I hope you're all having a wonderful weekend so far! 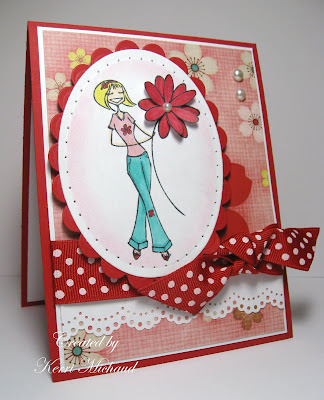 I wanted to post my card that I made for this week's Fun-Frilled Challenge which was to make a fun and frilly card. When Michelle issued the challenge, I immediately thought of Bellas, because these ladies always look like they're having fun! I chose this cutie patootie daisybella because she's holding her big, frilly flower : ) I stamped the image twice, cut out one of the flowers, and popped it up on top of the original image. I added some pearls, the lacey looking border, and some fun polka dot ribbon to complete it! The paper is from My Mind's Eye~Just Dreamy 2 collection, and the CS is Real Red and WW. Thank you so much for stopping by today, and take some time to play along! You have until tomorrow to upload your card for a chance to win the AWESOME blog candy! This is so adorable!!!! Great colors and love the cut out flower dimension in her hand!!!! Great look, Kerri!!! She is just so cute and the whole card is great right down to that beautiful knot! super cute card! Love all the details and love the accent red!